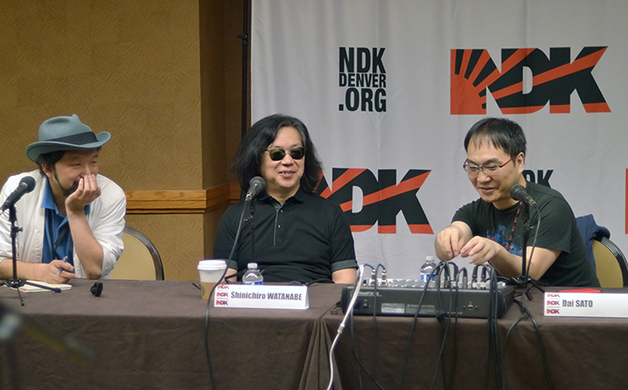 This past weekend, the Sheraton Hotel in downtown Denver hosted Nan Desu Kan, otherwise known as NDK. The convention’s name is a play on the Japanese phrase “nan desu ka?” which translates to “what is it?” NDK is Colorado’s largest anime convention, with over 21,000 attendees this year. This year proved particularly special, as the headlining guests were none other than Shinichiro Watanabe and Dai Sato. Watanabe and Sato are the director/writer duo responsible for the wildly popular anime shows Cowboy Bebop and Samurai Champloo. Both series broke traditional anime molds, and both shows were more successful in US markets than in Japan. Both men also have rather prestigious careers outside of Bebop and Champloo. Watanabe directed Macross Plus: The Movie and Space Dandy. He also directed two shorts for the Wachowski sisters’ The Animatrix, an anthology of animations that supplemented The Matrix universe. Sato has written for Ergo Proxy, Eureka Seven, and the Ghost in the Shell series. A live-action version of Ghost in the Shell will star Scarlett Johansson and is set for a 2017 release. To give you some idea of how famous these men are in the anime community, you should know that some con-goers literally wept with overwhelming joy during their panel. Some even fainted. In a sense, they’re kind of like The Beatles or Michael Jacksons of Japanese animation. And believe it or not, they had some words for Colorado’s cannabis lovers. Samurai Champloo, on the other hand, went the opposite direction from Bebop, moving from a futuristic outer space setting to feudal Japan. Samurai Champloo was especially known for being quirky and anachronistic, as it fused America’s hip hop culture into a universe that far predated break dancing and rap. Both shows defied anime stereotypes and their genres’ generic otaku conventions. Watanabe kept Sato as a main writer because Sato was "new blood" to the writing scene – and Watanabe wanted someone "crazy" to provide fresh ideas for his shows. As a result, both series became known for their pot-addled easter eggs, as both shows wrote blatant cannabis use into the episodes – something no other anime series had ever done before. Cowboy Bebop was their first foray in to this dangerous territory. Cannabis use is especially frowned upon in Japanese society, but the dynamic duo subverted Japanese TV censors. One of Bebop’s later episodes included space hippies passing around a joint, and they showed a clip of this scene at the Saturday panel. A translator for Watanabe said, “We did just tell the censors this was ordinary tobacco, 'Nothing to worry about,'” followed by riotous laughter from the panel’s audience. Throughout the panel, both men referred to cannabis culture as “Colorado style,” an inside joke between the Denver locals and our Japanese guests. 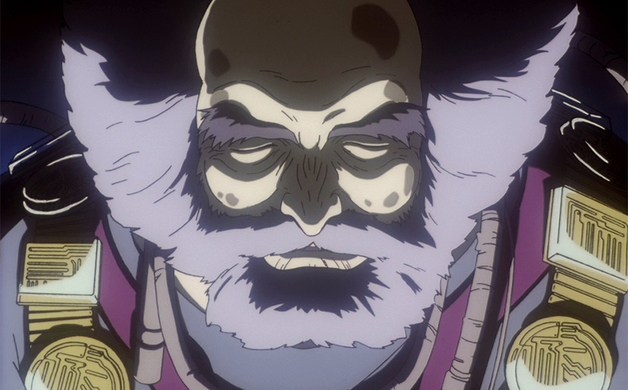 They also said they modeled Chessmaster Hex in Bebop after Jerry Garcia of The Grateful Dead. Sunday’s panel focused on Samurai Champloo, the wicked swordplay series that featured an episode where a marijuana farm was burned to the ground. All these weed references got people wondering if Watanabe and Sato ever smoked up. When asked by an audience member whether they had sampled Colorado’s legal cannabis products, Watanabe simply replied, “No comment,” to which both men then erupted in chuckles. We’ll take that at face value. Thanks, guys.